When planning a trip to Turkey you might consider traveling independently or booking a package holiday, there are pro’s and con’s for either option. Well, package tours are generally a combination of excursions and trips that are all pre booked and put together to form a ‘package’. This means that from the moment you board your flight and fly away from home you will not need to plan anything. In fact the word ‘planning’ shouldn’t even come into your mind because it is all taken care of by your travel agency. Services like accommodations, transport, daily tours and sometimes food and evening activities are included. Package tours can last anything from a day to a week to a month or even longer and most travel agencies give you options to select your preference so your holiday itinerary can be personalized to suit you. Selcuk: This traditional town is nestled between lush green mountains, just 18 km from the seaside town of Kusadasi and 3 km from the 2nd largest ancient city in the world, Ephesus. Here you can taste typical Aegean cuisine in quaint restaurants and drink wine in the old Greek village of Sirince after visiting the House of the Virgin Mary and the Cave of the Seven Sleepers. Kas: A bustling port town with a pretty harbour and crystal clear water, located on the edge of the specially protected Kekova region which is home to Lycian ruins, both on land and under the sea, stunning secluded bays and breathtaking sunset spots. Don’t forget, the region is also one of the best scuba diving locations of the entire Turkish Coastline with abundant sea life and colorful plants. 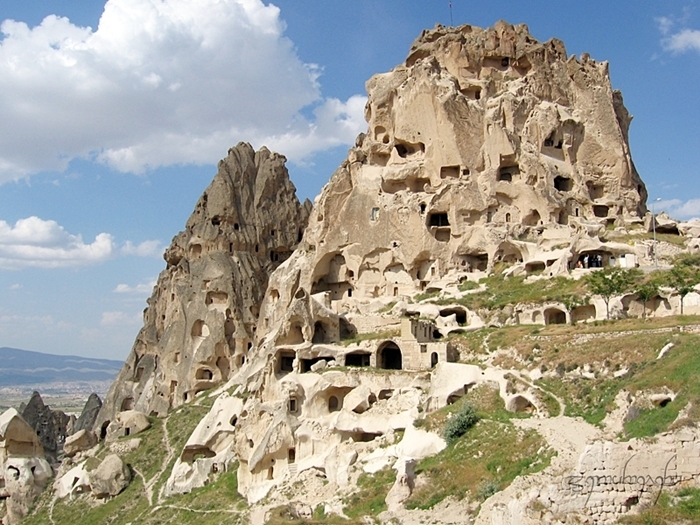 Cappadocia: The ‘Land of Beautiful Horses’ where hot air balloons fill the air each morning at the sun is rising and extensive valleys are filled with Fairy Chimneys, stone age caves, pigeon homes and cave hotels. Historians will want to visit UNESCO Goreme Open Air Museum, home to Early Christian churches and original frescoes, while the adrenalin seekers can explore the region on foot, by horseback, by jeep or by speedboat. The Gallipoli Peninsula: Where the famous Dardanelles Campaign took place back in 1915. The peninsula is scattered with grand monuments and tributes to the fallen ANZAC and Turkish troops who fought in the battle of Gallipoli. Original WW1 trenches and battlefields still remain untouched and a sunken warcraft lies in wait below the water at Anzac Cove. Istanbul: It is impossible to visit Turkey without paying a visit to this iconic city. With so much history and culture packed between the ancient walls of Constantinople a package tour would certainly be an advantage. Explore the Sultanahmet District where the famous Blue Mosque and Hagia Sophia dominate the skyline. Browse the Grand Bazaar which spills out across 67 tiny twisting streets, or relax on a Bosphorus river cruise and listen to the sad tale behind the Maiden’s Tower. ● Skip the Planning: Planning a vacation to anywhere can be stressful, confusing and take a lot of time, but when you book a package tour you can simply skip all that trouble. Local experts have already done the necessary research to make your vacation run smoothly therefore you will be able to focus on relaxing and enjoying the wonderful sights in Turkey. ● Visit the Top Destinations: You will be able to visit multiple cities and visit the best sites. If you want to see a lot of Turkey but don’t have so much time then a package tour can be a good option, with transport and tours pre-arranged you won’t have to worry about losing a day of your vacation running to and from the bus station or figuring out confusing public transports. ● Help with Luggage: Maybe you are someone who doesn’t like to pack light and getting on and off of buses and between hotels with a heavy suitcase can seem like a big hassle, especially during Turkey’s hot summer months. However a package tour you would have direct door-to-door transfers so there’s no need to break a sweat. ● Expert Local Guides: When visiting some of Turkey’s ancient UNESCO sites and natural phenomenons you will have the benefit of an experienced tour guide with local knowledge so you can really make the most of your vacation. ● Limited Flexibility: Before booking your package holiday you will have the opportunity to browse the web and find the tour which is right for you, however some will still find a package tour restricting as you will be tied to your scheduled itinerary. If you like your vacation to be spontaneous then independent travel may be a better option. ● A Whirlwind Trip: While for some holidaymakers visiting a different location every day will be perfect, but for others hopping from the ‘Cotton Castle’ to a gulet cruise to a Cappadocia and Istanbul Tour can feel like a little too much and a little too fast. So if you're someone who likes take it easy, you might prefer to organise your own itinerary. Whether you decide to book a package tour or to discover the wonders of Turkey independently, with so many beautiful natural sights to visit, quirky towns to explore and beaches to relax at, you are sure to have a fantastic holiday in this magical country.